For the past year, children in the 2B clinic waiting area have been enthralled while listening to stories read by volunteer readers who share books in English and French with children as they wait for their appointments. Parents are encouraged to join in too. 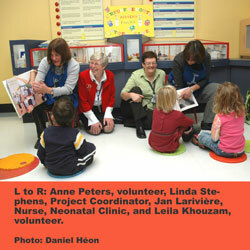 Story Hour is part of the MCH literacy promotion program Imagine: Lire/Read , which includes books being given to young clinic patients by their health care practitioner, along with information that encourages parents to start a habit of reading with their children. Other MCH programs include Books for Babies in the NICU and PICU, which offers parents books to read to their children in intensive care, and a program in the Adolescent Postpartum Clinic. The program coordinator is Linda Stephens, and it is championed by Jan Larivière, MCH nurse in the neonatal clinic, who work in partnership with the Centre for literacy. Family Literacy Day is celebrated every January. The 2009 celebration at the MCH will include a Medical Grand Rounds presentation on January 28 by author and literacy advocate Roch Carrier, who wrote the Hockey Sweater. Stay tuned for more information.